By now, you're probably like, "OK GIRL BUT WHERE IS THE DRESS FROM." So let me get to that. I found this Brigid Ruffle Dress on Fashion Nova Curve when I was scanning every single store for a beautiful red dress. If you read this blog post: HOT DAMN, you know that I had my sights set on a red-colored dress that I could feel scorching hot in all summer. This dress wasn't exactly what I envisioned, but as soon as I saw it, I put it in my cart and never looked back. The sleeves are what got me so excited, but they also make the dress costume-y, which makes it difficult to wear this dress on any given Saturday night out. Or maybe I am just over thinking it, and I should wear the damn dress because life is short and this piece deserves to be seen. I know this dress is everything, but it's sold out since I received it. So I have included a couple of similar dresses for you in the shop widget below. You can also sign up for the wait list if Fashion Nova decides to restock it! 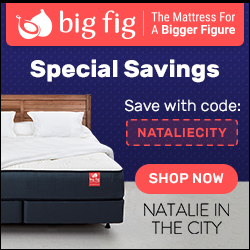 If it is in stock, and you're able to score it, be sure to use the code "natinthecity" for 15% off your purchase! SIZING INFO: I am wearing a size 2x in the Brigid Ruffle Dress, which is my usual size, and it fits perfectly! This dress is made out of stretchy material so it does stretch! Fashion Nova sent me this dress to review. All opinions are my own!